DNR officials are trying to get to the bottom of the deaths of six wolves. Dead wolves were found in Ashland, Monroe, Vilas, Rusk, Juneau, and Adams Counties right around the time of the November gun deer hunt. Gunshots were obvious on several of the animals. DNR wolf expert Adrian Wydeven says there are concerns that some hunters may be taking matters into their own hands. He says there were many complaints this year from hunters who didn&apos;t see many deer, but saw evidence of wolves all over the place. 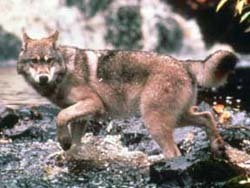 A lawsuit put the wolf back on the federal endangered species list earlier this year. Wydeven says there can be substantial penalties for killing an endangered species, with fines of up to $100,000.